Trust the Danes to arrive in style on bikes to meet the Queen. Denmark’s first ever female prime minister Helle Thorning-Schmidt and ministers from the Liberal party decided to arrive at the Queen’s residence on Velorbis Victoria Classic ladies and Velorbis Churchill Classic gents bicycles. You can watch the video here (it’s in Danish). 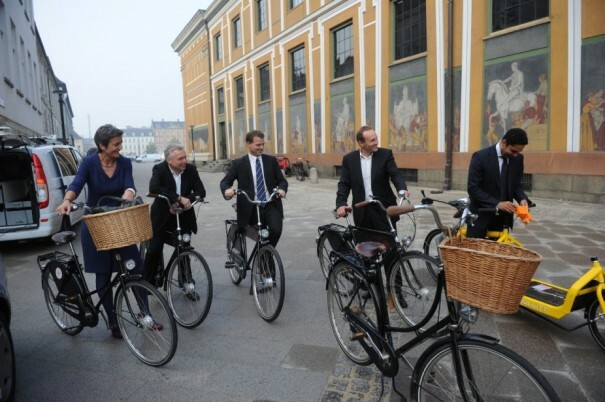 The Velorbis bicycles are part of a large Velorbis bicycle fleet available for politicians to use for getting to and from meetings at various locations in central Copenhagen. The new government has announced that it will integrate green policies as a main element of their administration in order to make Copenhagen even more bicycle friendly. We can’t wait to see what they come up with!